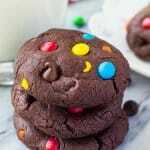 Fudgy, chewy, super soft M&M Double Chocolate Cookies! 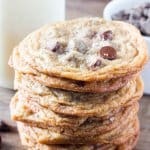 The perfect M&M chocolate chip cookies for true chocolate lovers! 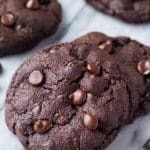 Double chocolate cookies are my ultimate weakness. 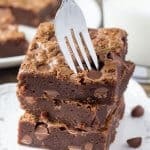 Fudgy, chocolate-y times 2 – I love getting the texture of my favorite chocolate chip cookies and the flavor of my favorite brownies in one. So when mini M&Ms were on sale – it was the perfect excuse to make a kid approved version (although – adults gravitate toward these too). 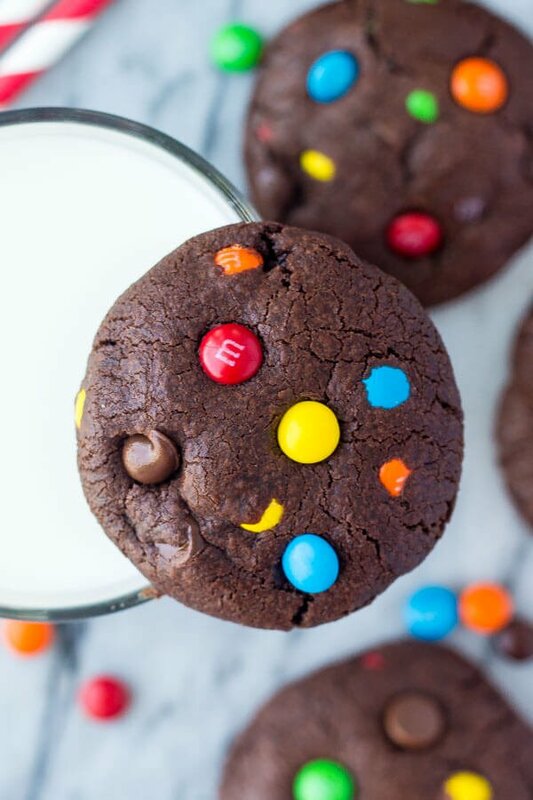 Enter M&M Double Chocolate Cookies. 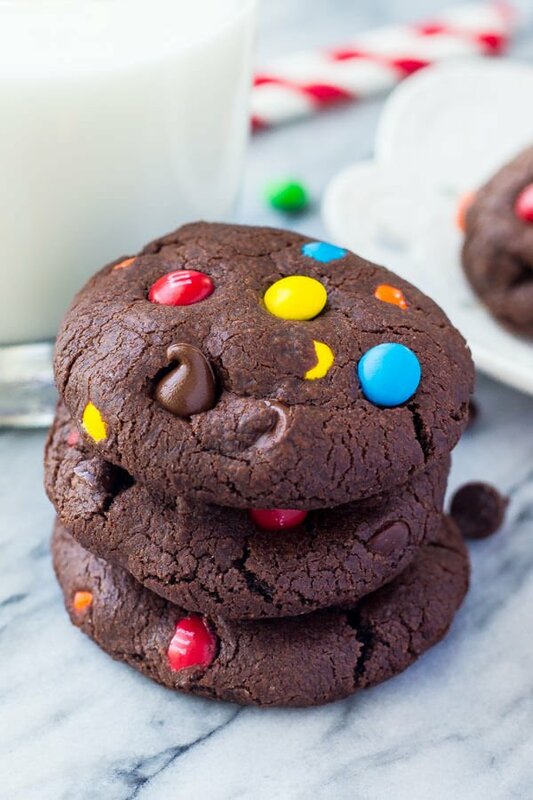 Soft, chewy super chocolate-y cookies filled with chocolate chips and mini M&Ms. The M&Ms give a pop of color, and you’ll love the crunchiness of the candy coating in cookies. (If that make sense)…. Melted butter for softer cookies. Adding some melted chocolate to the batter for a fudgier texture. More brown sugar than white sugar = more chew. The perfect amount of flour. A little cornstarch for softer, chewier cookies. Lastly, it’s sooooo important to chill the dough before baking. This creates thick, pudgy cookies and combats the evil cookie spreading. (Ok – I know my Mom taught me not to call anyone evil…. And I know some people like thin & crispy chocolate chip cookies). But if you want your cookies to be thick & pudgy like the ones pictured, make sure to chill your dough. Then slightly under bake your cookies to give that melt-in-your mouth consistency. It’s like a delicious bite into double chocolate heaven. You’ll notice in this recipe I used melted semi-sweet chocolate. I found semi-sweet made the cookies super chocolate-y without being too rich. You could use dark chocolate instead, but I wouldn’t go any higher than about 60% cocoa solids or your cookies may end up too bitter. Plus, I find more people are likely to have a bag of semi-sweet chocolate chips in their pantry already. 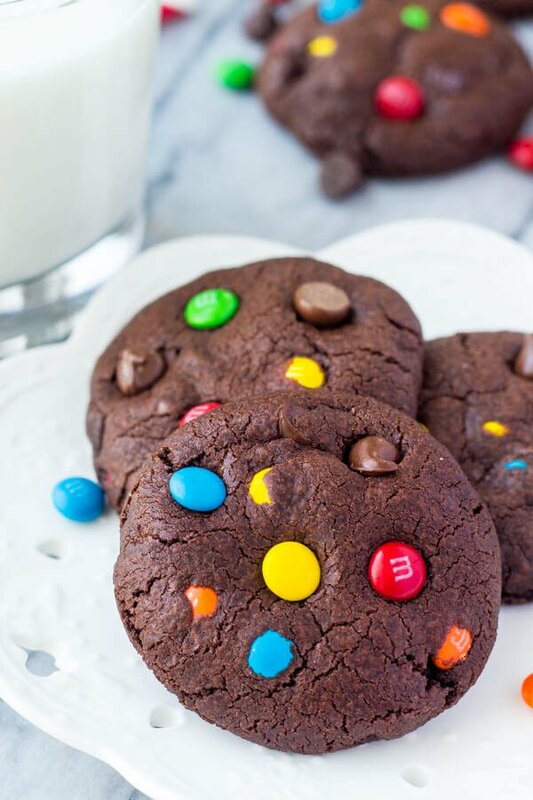 The cookies are fudgy, the M&Ms are fun, and these are seriously to die for! In a medium-sized bowl whisk together the flour, cocoa powder, cornstarch, baking soda & salt. In a separate large-sized bowl using an electric mixer beat together the melted butter, sugars and melted chocolate until evenly combined. Add in the egg and vanilla and continue beating until mixed. Turn the mixer down to low speed and carefully beat in the flour mixture. Then turn off the mixer and stir in the M&Ms and chocolate chips. Cover the bowl with clingfilm and refrigerate for 2 hours or overnight. When ready to bake, preheat the oven to 350F degrees and line 2 cookie sheets with parchment paper or silicone baking mats. Allow the cookie dough to warm up for about 15 minutes or a little longer if it was in the fridge overnight. Form the dough into balls about 1.5 tablespoons in size and place 2 inches apart on the cookie sheet. Bake for 8-10 minutes, or until the tops look just set. 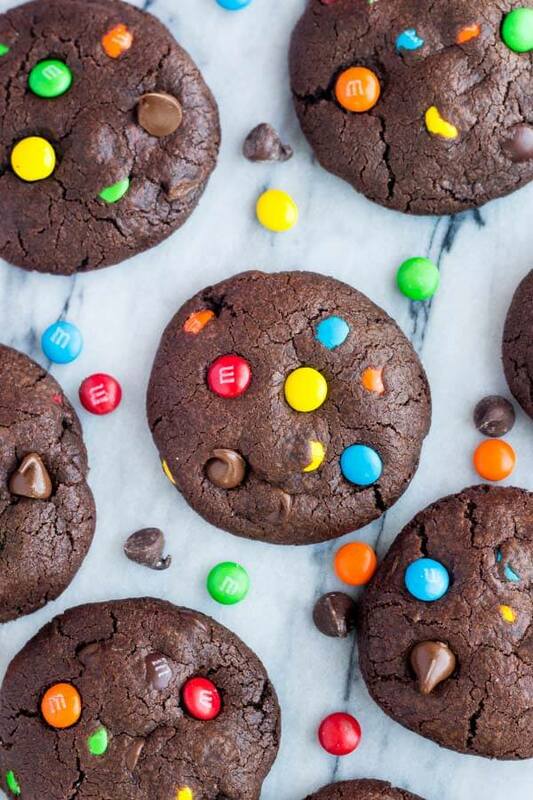 After cooking, you can place a few extra M&Ms & chocolate chips on the top of each cookie. *Cookies store well in an air-tight container at room temperature for about 4 days. **Cookie dough balls can be frozen in a ziploc bag for about 2 months. Then the dough balls can be cooked from frozen. They'll need about 1 extra minute baking. Oh! These cookies are perfection!! Heavenly. Seriously, it just doesn’t get any better than a big fat cookie chocked full of M&Ms! Need to try these ASAP! Totally with you there! M&Ms make everything about 1000x better! These are just the HAPPIEST cookies. So nostalgic!